On Saturday, the National Policy Institute (NPI), an organization aligned with the “alt-right” movement, assembled in Washington, D.C. to celebrate Donald Trump’s election to the presidency. 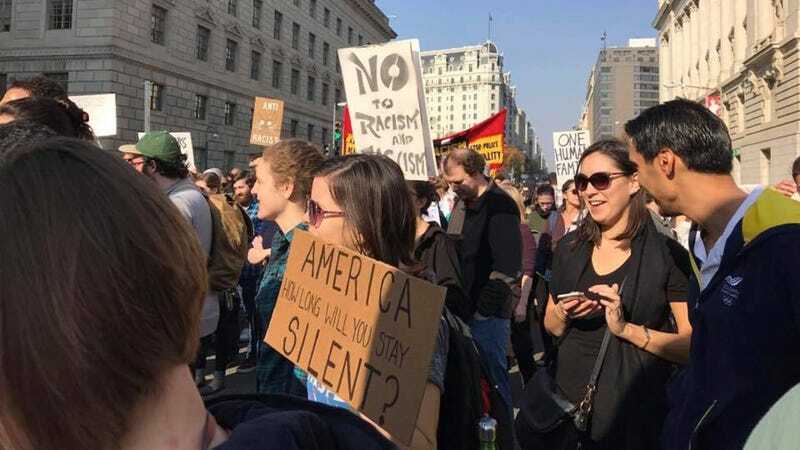 They were met with vehement protest by hundreds of D.C. locals, who marched down Pennsylvania Avenue to condemn the group’s presence. A name like “National Policy Institute” obscures any particular agenda, but to be clear: the NPI identifies with the alt-right’s loose ideology of white nationalism, racism, sexism, and anti-Semitism. They exult in Nazi iconography. And as their president, Richard Spencer, has made clear, they regard Trump’s win as their own. NPI convened this weekend at the Ronald Reagan International Trade Center on Pennsylvania Avenue, just minutes from both Trump’s newly opened hotel and the White House. Attendees included reality television personality Tila Tequila, British anti-immigration activist Peter Brimelow, and of course, Richard Spencer himself. Trump has denied any affiliation with the alt-right, and as Politico reports, Spencer himself does not believe the president-elect to be a member. That said, NPI and others sharing their views feel empowered by his victory, and interpret his successful campaign as an endorsement of their agenda. Of paramount importance to the alt-right is a stringent immigration policy. In fact, they argue for a 50 year ban on all immigration to the United States, with a few exceptions for Europeans. It’s unclear to what extent NPI’s wishes will be granted. However, they are so far galvanized by Trump’s appointments — particularly Steven Bannon, the former chairman of Breitbart News, to White House chief strategist and Senator Jeff Sessions (R-Ala.) to Attorney General. Bannon has long been accused of anti-Semitism, and in 1986, Sessions was deemed too racist to serve as a federal judge. “Jeff Sessions being in charge of enforcing civil rights laws makes me want to sing,” an NPI attendee from Virginia told the Washington Post. Many alt-right affiliates express their yearning for a white oasis of sorts, where minorities would be entirely excluded. It would, however, be acceptable to live amongst a small number of Filipinos, included for the sole purpose of performing subservient labor (including nursing). A college student attendee told the Post that he was unsure of how to achieve such wholesale segregation without violence. “This is not an empirical science,” he remarked. At the conference, Spencer reiterated his optimism in Trump’s presidency, born from his campaign and its enthusiastic supporters. “There’s been an awakening,” he said to the predominately white male crowd. It appeared that roughly half of the attendees were under 40 years of age. Meanwhile, outside the Reagan building, over 200 protestors vigorously condemned the NPI’s gathering. My husband Paul and I were among the crowd, a diverse group chanting in unison against fascism, racism, and the various iterations of intolerance championed by the alt-right. Police officers swiftly intervened in the skirmish. Two protestors were apprehended, and at least one was handcuffed and arrested. The NPI attendee who had initiated the fight was not similarly collared.